One year ago tonight, we were rehearsing for the happiest day of our lives. There were many obstacles trying to prevent Taylor and Michelle’s wedding from being all they had dreamed. Her wonderful mother, Dana, and I were nervous as so many things seemed to be going wrong. As we were trying to quietly practice the wedding ceremony, the double booked party at our event center began to spread outside where we were. Out popped a very dear CVCS teacher who was close to most of the wedding party, Claudia Mehlhaff. As we visited with her, the joy and concern disappeared from mine and Michelle’s mom’s faces. 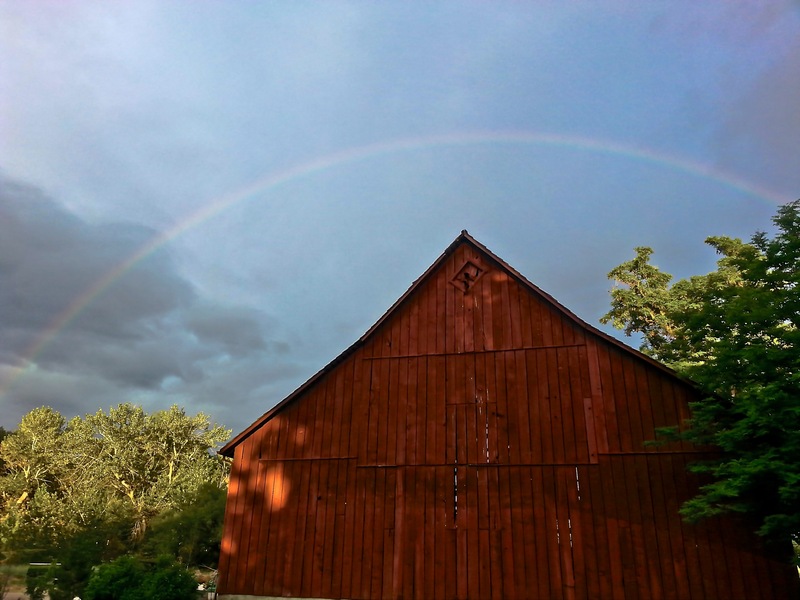 As we turned back to finish the rehearsal, this beautiful perfect rainbow, photographed by my brother, Matt, hung over the backdrop to the wedding ceremony. Dana and I knew the wedding was to be perfect and God wanted us to trust Him with everything. The wedding day was anointed and many commented on the sweet joyful spirit that filled the evening. We all felt the special presence of the Holy Spirit and I wondered at the time why He would shower us with so much joy and hope. He knew we would have to hold onto that moment as the year passed on from there. He also knew that I would need my precious “daughter-in-love” to sweeten our lives. I’m so grateful for her! This week has been perhaps one of the hardest for me, yet today as I was allowing myself to grieve today, at just the right moment God sent a text through someone, who normally does not text me, with a word of encouragement, He prompted a friend to call me that I was aching to talk to, and He gave me a massage therapist who understood my faith and needed to hear my story today for her own encouragement. All week messages from so many on Facebook and others I have seen have loved on me for God reminding me of His rainbow promise from last year. He is so faithful! Once again I began to start thanking God for his constant faithfulness to meet me where I am and to help me get through another stage of grief, another first, another “should have been”. I’m thankful for Michelle and her wonderful family, for my precious husband and our amazing children, Shawn, Drew, Bethany, Angie and Josie. I’m thankful for Taylor and Michelle’s friends and their constant love and support and for all of them, like Paul, who are taking such good care of our “daughter-in-love”. I’m again thankful for all of you who have been so faithful to pray and love on us this year in ways I’ve never felt loved before! Most of all I’m thankful for our story of hope: When grief hits so hard I can’t breathe, I can look up to the Giver of Hope and rejoice knowing He has overcome the world! John 16:33 (NIV) “I have told you these things, so that in me you may have peace. In this world you will have trouble. But take heart! I have overcome the world.” (Bethany’s favorite verse).